Esteemed psychologist Mihaly Csikszentmihalyi brings together decades of research to lead us on our path to happiness. Read on to find out why Flow – The Psychology of Optimal Experience is one of Bill Clinton’s favorite books. It doesn’t surprise us that this book is popular because Mihaly Csikszentmihalyi expertly combines general and scientific knowledge with a casual writing style. And then there’s the great content, too. Flow – happiness is attainable, no matter different cultures, physical condition, status or wealth, but requires work. Csikszentmihalyi, originally from Eastern Europe, came to the United States to start a career in psychology. He was especially intrigued by the sense of meaning in general, and the meaning of life in particular. The world needs your contribution! Not only for providing the society with a service, but also for yourself. So, an unhappy person is a pain for the society, if you don’t like your job – quit immediately. Have some pride, flow through life; do not swim. A worried person is detail-orientated if you are such change your surroundings. Follow the basic solution that Mihaly Csikszentmihalyi talks about. GetNugget contributes as well to his theory by paying close attention to each step of this helpful process. 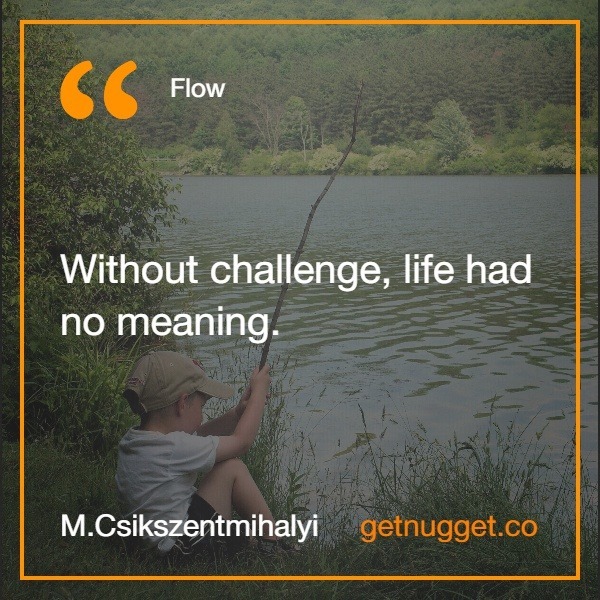 The book “Flow” prompts one question – Do I need this suffering (referring to your job)? If you think you deserve better – fight for it. Take what is yours rightfully! Push your mind to the limits, the only way for a person to become more productive is to feel self-satisfied. Depressed individuals can barely stand still. What steps should you take to find your contribution more valuable? Transform your dull and routine life into something more dynamic. Perhaps, not too dynamic like some action movies, but creative enough to make you believe in something, live each day as if it was your last. 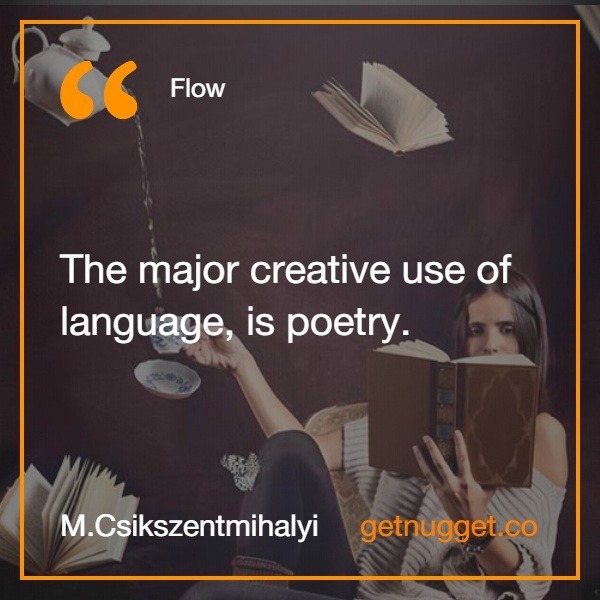 Flow is based on Csikszentmihalyi’s 20 years of research into the phenomenon of ‘flow’. He observed the state of mind of artists, who are totally absorbed in their work when they create something. He also asked artists, mountain climbers, workers, and athletes about their feelings when they created their own activities. Besides interesting facts about history, philosophy, and science, we find out that the state of flow is an ancient philosophy, sometimes known as Ju or yoga. This state of flow is present in all types of activity, everything from work and leisure to personal relationships. We’re interested in it because of its ability to make us happy. We all long for happiness but we have no clue where to find it; if we do find it, we usually don’t know how to keep it. Think of all the advances of the last century, the scientific breakthroughs, the changes in technology, the diseases we wiped out, the growth of our economies and our wealth. Sure, divorce rates are at an all-time high. There are conflicts and terrorism, and we have yet to find a cure for cancer. But overall our standards of living have gone up. W can travel, we can share our favorite photos with the entire world, we can keep in touch with old friends who live thousands of miles away. So why aren’t we happy? Mihaly Csikszentmihalyi explores the human mind, and what it needs to attain flow. We can use the skills we possess to help direct our attention towards our goal. The process is guided by attention and sustained by energy. But enjoyment occurs just for those who are motivated by the pleasure of doing something, and not by external influence. The road towards our goal allows us to “flow” optimally and effortlessly. The higher the goal is, and the more effort you put into it, the more substantial and stable the growth. We have the ability to experiment with a flow in almost every activity: through our senses; moving; creating; accomplishing basic physical needs or complex mental tasks – playing chess, solving crosswords; or spending time with friends and family. All these can be transformed into very enjoyable minutes or even hours. The choice is in our willpower. The main benefit of the experience is that we acquire new skills, obtain a higher understanding of a situation, develop ourselves. It prepares us for the next challenge, tougher than the previous one, and the ability to enjoy the path we are following becomes easier. The quality of the goal determines your level of spirituality. With practice, we find we’re able to change our moods, the direction of our thoughts, and make them work for our benefit. The process described in Flow by Mihaly Csikszentmihalyi is further investigated for its use in several areas of human existence. One in particular, flow in work, has been developed and put into practice by many others. Spending more time at work than at home means we have to create work places, environments, and conditions that bring us enjoyment and increases our performance. Specialists find it interesting that satisfaction in work doesn’t depend on position, reward, or environment, but rather on our ability to improve, to produce higher-quality work and enjoy what we do. In chapter 9, “Cheating Chaos”, Csikszentmihalyi describes the research he carried out on people with physical disabilities. We hear stories of several of our peers, who were either in accidents or born with a disability. Their moods, work, and lives are the same as someone without a disability. We can easily learn to find happiness if we accept and enjoy whatever life throws our way. It’s all about knowing ourselves and our limitations, and adjusting our goals.